1. Combine all the marinade ingredients in a bowl and massage it evenly on the fish pieces. 2. Cover and keep them in the fridge for 30 to 60 minutes. 3. Dry roast all the masala ingredients, except oil, and transfer to a mixer jar. 4. Add oil and grind to a fine paste. 5. Heat 1 tsp oil in a pan. 6. Fry the mustard seeds, fenugreek seeds and curry leaves. 7. Add the onions and saute for a minute or two. 8. Add the ground masala paste, tamarind extract and mix well. 9. Simmer for 2 minutes and add the coconut milk. 10. Stir gently and reduce flame. Simmer for 10 minutes. 11. Heat 1 tsp oil in a frying pan. 12. Fry the marinated fish till golden brown and crisp on both sides. 14. Add the fried fish to the gravy and cook till tender. 15. Garnish with coriander leaves, curry leaves and lime juice. 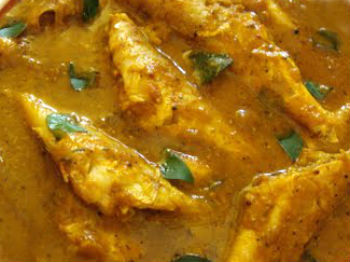 Feel free to comment or share your thoughts on this Chettinad Fish Curry Recipe from Awesome Cuisine.